You'll be £16.99 closer to your next £10.00 credit when you purchase From the Dardanelles to Oran. What's this? This collection of thought-provoking essays by arguably the 20th century's greatest naval historian was first published in 1974, but their continuing relevance fully justifies this reprint. It opens with a stimulating reappraisal of the naval attack on the Dardanelles, the success of which would have made the disastrous Gallipoli land campaign that followed completely unnecessary. Marder identifies a number of relatively minor issues that made a failure of what was in reality a great strategic opportunity to shorten the war. Other chapters cover what the Royal Navy did and did not learn from the Great War, and Churchill's controversial time at the Admiralty before he became Prime minister in 1940, while Marder's analysis of the inter-war Ethiopian Crisis – asking whether military aggression can be countered by sanctions – has powerful echoes of current political concerns. The final essay looks at one of the most contentious episodes of the Second World War, the British pre-emptive strike on the fleet of their one-time allies at Oran after the French surrender in 1940. Because Marder's view of history emphasises the human dimension over abstract forces, his work is always approachable in style and of as much interest to the layman as the professional historian. This book is no exception. This paperback edition of a Marder classic first published in 1974 is particularly welcome, as the book has been out of print many years. 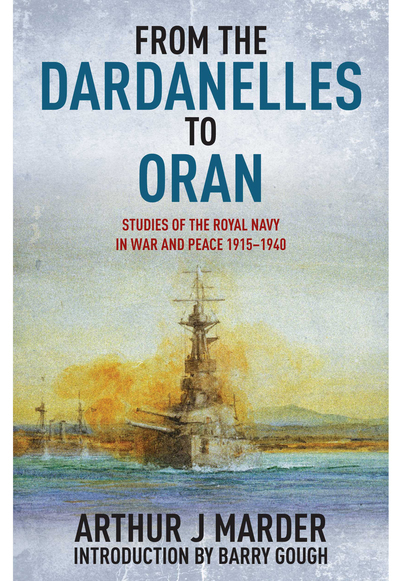 From the Dardanelles to Oran is a collection of essays on the Royal Navy, some of which had previously been published as articles in academic journals, while other had their origins as lectures. ALTHOUGH Arthur Marder is best known for his powerful work on the Royal Navy in the First World War – From Dreadnought to Scapa Flow, his later work is also of significant interest. ... A timeless work recommended for all naval enthusiasts who appreciate a good intellectual challenge. A celebration of the centenary year, this very welcome new addition opens with an introduction by Barry Gough the popular Canadian maritime and naval expert and historian. With an array of illustrations and maps this book is sure to grab the interest of all those with a love of military history. The book is well indexed and sources clearly identified, including the galaxy of admirals personally consulted by Marder and references to original papers in the National Archives that he used - and those not exclusively naval ones. This collection of thought-provoking essays by arguably the 20th century's greatest naval historian was first published in 1974, but their continuing relevance fully justifies this reprint.